It's 1970, and public interest in the Apollo missions to the Moon is fading fast. America has beaten the Soviet Union to place a man on the Moon, and further missions are seen as either routine or a waste of resources. Against this backdrop, astronauts Jim Lovell (Tom Hanks), Fred Haise (Bill Paxton) and Jack Swigert (Kevin Bacon) take off in Apollo 13. Lovell had previously traveled to the Moon on Apollo 8, but the Apollo 13 mission would be his final opportunity to fulfill his dream of landing and walking on the lunar surface. Swigert is a late replacement for Ken Mattingly (Gary Sinise), who is believed to be sick. On the way to the Moon and soon after the crew transmit an ignored television broadcast from space, an oxygen tank explodes on-board Apollo 13, causing severe damage to the Odyssey Command Module, as well as a loss of power and oxygen. Odyssey is powered down and the three-man crew take refuge in the Lunar Module Aquarius, designed to sustain two people for a matter of hours while they hop onto the Moon's surface. For the next several days, the exhausted, sleep-deprived crew, working with the engineers at Mission Control and Flight Director Gene Kranz (Ed Harris) in Houston, have to maintain their composure and frantically improvise a way to get back safely to Earth using stricken equipment and hardly any power. 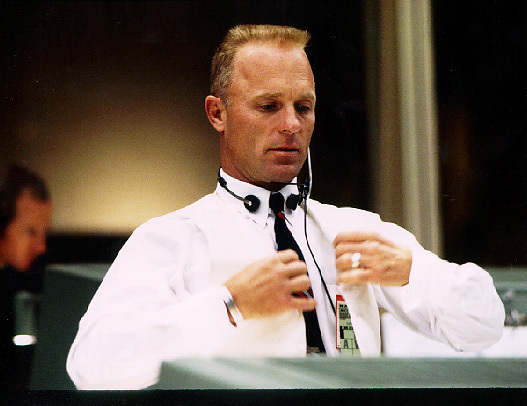 The grounded and quite healthy Mattingly is hastily recruited to Houston to work on the simulator and help develop solutions to the chronic power shortage on-board Apollo 13. In recreating an epic true-life drama, director Ron Howard expertly triangulates the Apollo 13 story. The film alternates between the astronauts on-board the stricken spacecraft struggling to survive; the NASA ground control team scrambling to find solutions to a succession of never-anticipated problems; and Lovell's wife Marilyn (Kathleen Quinlan) dealing with the trauma of waiting to learn from the suddenly interested TV broadcasts if her husband will live or die. The script by William Broyles Jr. and Al Reinert, adapting Lovell's book, delivers a triple lesson in essential leadership skills from each of the three story angles: Lovell has to hold his crew together in the face of desperately dark prospects; Kranz has to squeeze every drop of innovation and ingenuity under enormous time pressures from the brightest engineers that America has to offer; and Marilyn has to keep her family, including Jim's almost senile mother, relatively sane under the glare of the media circus that suddenly descends upon them. Apollo 13 is a technical marvel, with the Houston Command Centre, the spaceship controls and interiors, and the astronaut suits recreated to the last detail, and the in-flight scenes filmed in actual zero gravity. Ed Harris is an unforgettable presence as Gene Kranz and emerges as a true hero, but the entire cast is comfortably flawless. 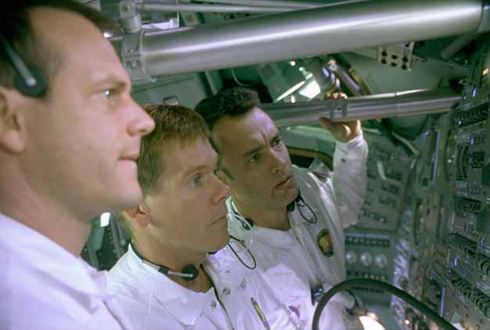 A perfect canvas for Ron Howard's talent of delivering emotionally powerful tales that focus on the exceptional abilities of the human spirit, Apollo 13 is an accomplished and rousing example of how some great triumphs are initially camouflaged as blatant disasters.